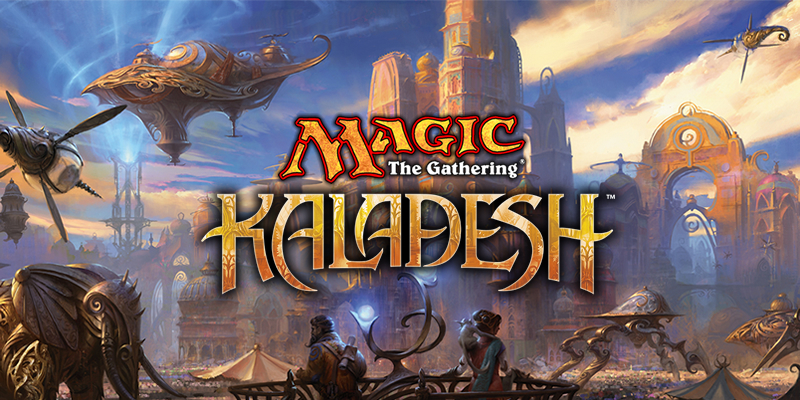 Kaladesh is al­most upon us, and with that in mind it’s time we take a look at one of my favourite events of the year, the pre­re­lease. Taking place on Saturday and Sunday the 24th–25th of September at lo­cal game stores and oth­er venues through­out the coun­try, the Kaladesh pre­re­lease will be our first chance to get a hands on taste of this set and its Limited en­vi­ron­ment. For peo­ple who are un­fa­mil­iar with the for­mat, here’s a very quick run­down. Prerelease falls un­der the Sealed for­mat, which means play­ers keep and open their own boost­er packs and make a 40 card deck us­ing only those cards. 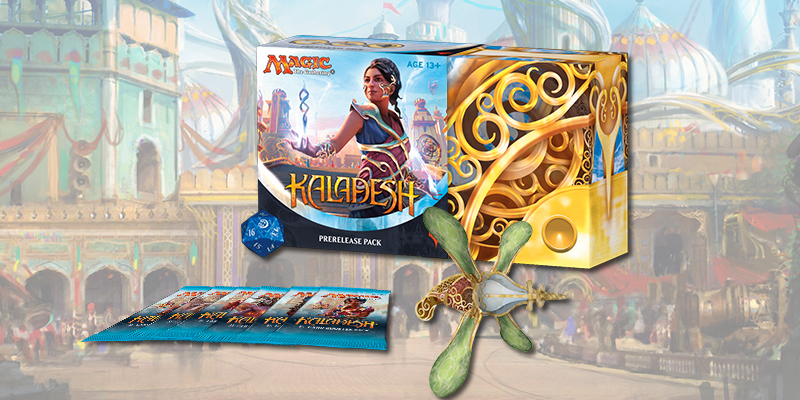 The cur­rent for­mat for pre­re­lease kits is nice and sim­ple: six boost­er packs, in this case of Kaladesh, one pre­re­lease pro­mo that can be any rare or myth­ic rare card in the set , one spin‐down twenty‐sided die bear­ing the sets logo and — in the case of Kaladesh — one pa­per­craft Constructable thopter, which is just there for a bit of fun. Wizards of the Coast also have a more ex­pan­sive guide to the Kaladesh pre­re­lease on the main Magic: The Gathering web­site. Some of us will find our­selves do­ing pre­re­lease in an un­fa­mil­iar lo­ca­tion. Be that be­cause of a re­cent move, try­ing out a new store, or the fact that we’re only just get­ting into the game. Be sure to know what time your event is start­ing and check if the store has any spe­cial re­quire­ments. For par­tic­u­lar­ly busy stores you will need to sign up in ad­vance for pre­re­lease, for oth­ers you may sim­ply be able to show up and pay that night. For those who only want to be sur­round­ed by oth­er adults, or want to be able to drink, a de­cent amount of pre­re­lease events here in the UK are held in pubs, bars, or func­tion rooms that will have more of the feel of a night out. This is a good choice for those un­fa­mil­iar or un­com­fort­able with a lo­cal game store en­vi­ron­ment. Some stores are also mak­ing at least one of their pre­re­lease events a Two Headed Giant event. If you’re un­fa­mil­iar with the for­mat you can read our primer on a Two Headed Giant pre­re­lease event here, but the con­cise ver­sion is that Two Headed Giant is a two ver­sus two for­mat where two per­son teams have a shared life to­tal. If you pre­fer this for­mat, or are cu­ri­ous about it, be sure to check which venues are hold­ing these events and on which days. Be more for­giv­ing with ac­ci­den­tal mis­plays than at oth­er sanc­tioned events. 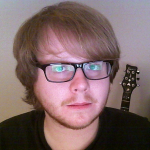 This might be someone’s first time play­ing the game, so don’t be rude or over­ly harsh. This is an op­por­tu­ni­ty to grow the game so don’t put play­ers off in what is po­ten­tial­ly their first ex­pe­ri­ence of a lo­cal game store. Help ex­plain how a card works if a play­er is con­fused. You don’t al­ways need to wait for a judge to come over if you can ex­plain to your op­po­nent what a card does. 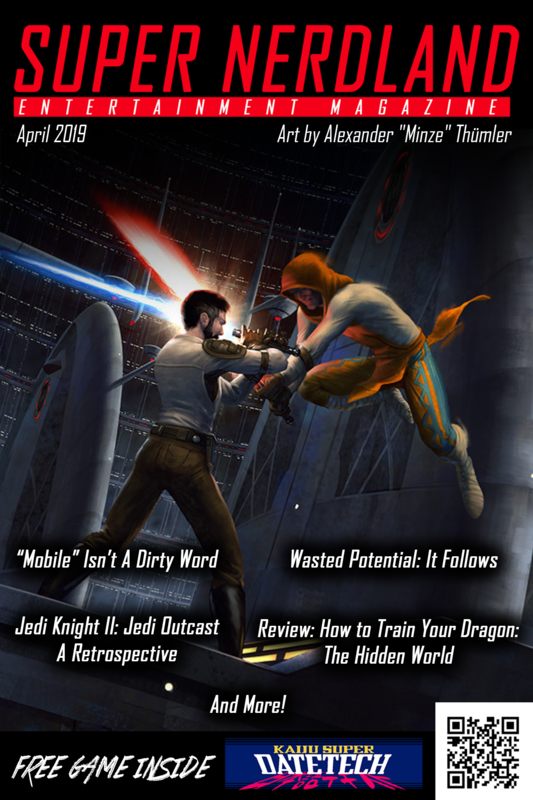 Prerelease is more about ca­su­al fun than com­pet­i­tive game­play and the en­vi­ron­ment should re­flect that. Bring some land cards. Oh god please bring some of your moun­tains or spare land for your own deck, and pos­si­bly even some for oth­er peo­ple. This not only helps out new play­ers but also helps out your store who I can guar­an­tee you will be thank­ful. Donate un­want­ed cards. Don’t just throw to­kens, bulk com­mons, and land away. Those are gold‐dust to new play­ers and small­er stores. The prac­tice of ‘draft chaff’ is well known and most sto­ries have a pro­vi­sion for cards left on the end of ta­bles or will have do­na­tion box­es for un­want­ed cards and to­kens. If you know a play­er who would ben­e­fit from them, you can just give your un­want­ed cards di­rect­ly to them. They may not mean any­thing to you, but they’re they can of­fer a stepping‐stone into the game for some­one else. If you’re a reg­u­lar, you act as an am­bas­sador for your store and the game, so be sure to make pre­re­lease as wel­com­ing and friend­ly as pos­si­ble. Learn the me­chan­ics of the set. There are plen­ty of primers out there, in­clud­ing our own pre­view, that will give you a good overview of Kaladesh’s me­chan­ics and en­vi­ron­ment. Knowing how ef­fects work helps you eval­u­ate cards, build syn­er­gy and avoid mis­plays. Knowledge is pow­er. Read up on Spoilers. Continuing the theme of the pow­er of knowl­edge, know­ing what cards to look out for and get­ting a gen­er­al feel for the set and its pow­er lev­el will help you enor­mous­ly when choos­ing which cards to put in your deck. On a more ad­vanced lev­el, it also helps you know what cards to look out for. Sealed tends to be a slow­er for­mat. Generally, in sealed high­er mana cost spells are more playable than they oth­er­wise would be, so don’t be afraid to top off your curve with a few big, splashy spells. Just try not to use too many. Don’t get greedy. Unlike with draft, sealed gives you a set card pool you can’t con­trol. This can of­ten lead to a lot of off‐colour rares or pow­er­ful un­com­mons you want to use, but your deck won’t sup­port. Kaladesh isn’t mas­sive­ly multi‐colour fo­cused, so chances are you’ll be run­ning a two colour or even mono‐colour deck. Remember, the best cards are the ones you can cast. All of the ad­vice in this ar­ti­cle is ap­plic­a­ble to any pre­re­lease event as the for­mat doesn’t change sig­nif­i­cant­ly from set to set. I’m a huge fan of pre­re­leas­es, and wish this style of event took place in stores on more than a hand­ful of days in a year. If you have a play­group or live a long way away from a store it might be worth host­ing your own pre­re­lease, as un­used kits tend to end up for sale on­line for a rea­son­able price, at least in the short‐term. But host­ing your own events is a sub­ject I hope to tack­le on its own some time in the fu­ture. Just re­mem­ber to keep in mind the main point of pre­re­lease is to have fun. So good luck with your sealed pool and good luck har­ness­ing the arte­facts and con­structs of Kaladesh!